I have a feeling I know the answer to my last question, so I am going to save some time and also ask if anybody knows if the black kramer pup cover will fit over a fender pickup...I'd rather all black (without having to break out the paint can. No, pretty much any other pup will be better than stock Focus pup. Of course Texas Special is like three levels above. I'd recommend getting a mexican Fender single coil if you need a mid pickup, those are great for the money and are usually very cheap used. I dont ever use the mid pickup so i generally pull them out. the focus will have a bill lawrence (bill and becky) l500xl in the bridge and (now) the texas in neck position with individual voilume pots and the coil tap. I could never figure out a sound with the mid peickup that I liked. Me neither, but I put them in for looks. I put the empty pickup cover in for looks with a piece of tin foil inside to make it look real lol. less magnetic drag on the strings, more shielding lol. The Texas special is now in my f3000. 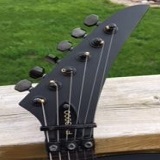 The stock black Kramer pup cover slid on perfectly :). It’s a bit shorter than the winnings, possibly due to the thick vintage style bobbin on the fender pup, but it will work. Now if only my damn order from stew Mack would show up I could finally play this thing! I got a hot pink condom pack of 9 gauge slinky’s waiting to be strung up! !